Do you want to immerse yourself in nature, to get to know new people, to escape boring everyday routines? With us you will will find what you are looking for! Out hostel is situated in the narrow strip of land of the north coast of Asturias, to the south of the Cantabric Sea the north of the National Park of Picos de Europa. Our location provides us with a one-of-a-kind rural atmosphere. You, our guests, constantly enrich our hostel with your backgrounds, stories and experiences. 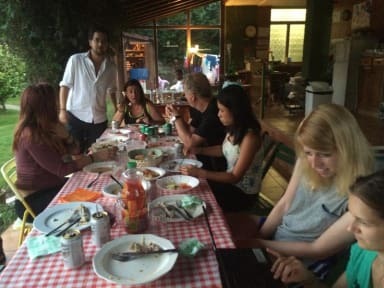 Especially for travellers who want to share their stories and get inspired by other's narrations our hostel is a marvellous place for encounters. The beach, a small, safe bay, is only 300m away. It is ideal for doing water sports and reading a book. If you prefer going hiking and enjoying stunning views, you can reach the National Park Picos de Europa within half an hour driving. If you want to get to know an Asturian city, you can visit the town hall Llanes (2-3km away). Here, you can visit historical houses, take relaxing walks on the Paseo de San Pedro and immerse yourself culinarily in Asturian culture. Payment options: cash, credit and debit cards. This property may pre-authorised your card before arrival. Biological Breakfast: Buffet, different prices.